Forget the sugar-laden sports drinks, and overly-caffeinated energy drinks that contain health-disturbing ingredients and get your energy the natural way. Here are 10 tips on how to increase energy levels naturally. Often fatigue is not simply due to a lack of sleep; it’s because of dehydration. This is one of the least expensive, easiest ways to ‘excite’ your cells and give your body the energy it needs to conduct the business of the day. Keep fresh water near you and sip on it throughout the day, and make sure to drink a tall glass first thing in the morning. It will help ignite a vigorous start. Not only is celery practically calorie-free, it is full of revitalizing B vitamins, and fiber, and evens calms the nervous system. If you want energy on the go, keep some cut stalks of celery in about an inch of water in a glass jar in your fridge, and grab them on the way out the door. The celery will stay crisp this way, and keep you from wilting, too. 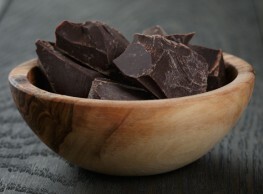 Dark chocolate is so wonderful for increasing energy that many athletes use it to boost their performance. It helps the body produce more mitochondria so that it can carry out cellular functions more easily. Make sure you purchase non-GMO, fair trade chocolate that is at least 70% dark cacao for full energy-giving benefits. This is how to increase energy levels naturally and deliciously. Spirulina is microscopic blue-green algae, and it is one of the building blocks in our food chain. This green superfood is full of life-giving nutrients. It contains high levels of plant-based protein (not soy-isolate that is called the ‘junk’ protein of the food industry and which often comes from GM soy), and amino acids as well as numerous antioxidants that reduce cellular damage and aid in the many functions of your body. Feeling a little slow? Add some spirulina to a glass of water or to a juice smoothie, and watch your energy soar. Depression is one of the most earth-shattering energy kills for many people. When you are depressed, you don’t want to spend time with friends, exercise, or be outdoors, and all of these things actually boost your energy levels. If you are depressed, though, consider some natural therapies, and not pharmaceuticals, because they can kill your healthy gut flora and lead to other unpleasant side-effects. It’s easier said than done, but it’s something that should not be ignored. Eating too little, and eating the wrong foods is a sure way to zap your energy. Sugar gives you energy short term, but just like lack of sleep, it robs you of long-term energy. Starving yourself will do the same thing. Yo-yo diets are the worst. You indulge in junk for a while, put on some weight, and then go on a ‘diet’ hoping to lose those extra pounds. This cycle will absolutely rob you of your natural vital energy. Try a lifestyle change instead, and slowly focus on eliminating foods that are bad for you, but always add back something you love that is also nutritious. Pretty soon, you’ll be bounding with energy, and you’ll also have a slimmer waistline. This is an extremely important tip on how to increase energy levels naturally. While it may seem obvious, many people expect to have energy even when they aren’t getting enough sleep at night, and self-medicating themselves with ‘uppers’ like sweets and too much caffeine. While these might give you a temporary energy boost, your body is deprived of the sleep it really needs, and you are over-stressing your adrenals to a point that they may soon fail altogether. Lack of sleep completely fries your hormones, and people who sleep less than five hours a night consistently are more likely to develop diabetes. Talk about energy-draining! Sleep deprivation also lowers leptin levels – the hormone that suppresses your appetite, so you aren’t doing yourself any favors by getting up too early or staying up too late. What’s more, you are likely to eat more when you don’t sleep. Everyone has to pull an all-nighter some time, but don’t make it a habit, and get your shut-eye to ensure sustainable energy. If you have iron-poor blood, you will definitely feel sluggish and lack life force. Actually, this is the leading cause of fatigue in women. You can certainly take an iron supplement, but even better – make sure to add some iron-rich foods to your diet which also contain important enzymes and nutrients that help you to absorb the iron. Beetroot-apple juice is wonderful for anemia, as are blackstrap molasses and sesame seeds. This imbalance of the thyroid and pituitary glands affects many unsuspecting individuals. With increased radiation exposure, this problem is becoming even more prevalent. You can find 7 natural treatments for hypothyroidism here. If you want to know how to increase energy levels naturally while boosting overall health, look no further than a colon cleanse. Regular colon cleansing is one of the fastest ways to regain energy. You can indulge in colonics, or just follow a simpler colon-cleansing diet, but if you clean out your body’s elimination system, you will actually absorb energy-giving nutrients better and all your energy won’t be zapped by Candida, parasites, and fermenting waste that sits in your gut unnecessarily. Do you have any tips on how to increase energy levels? Please share them below! **great advice**. I need to drink more water. I like the idea of drinking a tall glass of it in the morning upon rising. Its a reinvigorating cleanse especially with all of the stomach acid we wake up with.